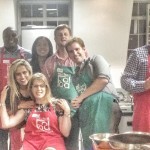 Wickedfood Cooking School in Johannesburg recently hosted members of TAL to an evening of competition cooking. Each cooking group was given the same ingredients and asked to cook a 3-course Mexican themed menu. The cooking class was a fantastic way of getting the team members to pull together for a common cause. As a team building activity the group performed like champions as the cooked food at the end was incredible. These cooking classes are a great way to relax and rewind in a non threatening environment. For more pictures from this fun team building cooking class, click here. Wickedfood Cooking School in Johannesburg also offers cooking classes to hobby cooks wanting to increase their skill levels in their own kitchen. Confidence starts by learning the building blocks of what makes a great dish. Its then followed by getting ones hands dirty and then tasting the completed food. These cooking classes held at our Johannesburg cooking school are scheduled every Monday at 6pm. Booking is essential. For the list of upcoming cooking classes, visit our website here.